Father left us yesterday evening to be absent a whole month, how long the time seems! he is gone to Georgia. We have a poor woman staying here tonight for whom my heart bleeds, she went down to the camps on horseback with her baby, only seven months old; to nurse her husband, when she arrived there this morning she found him dead and buried. She is now on her way back to her sad home. She is a very young woman, apparently quite poor, and has no parents living, as I hear her deep and frequent sighs from the adjoining room I can only pity her and be grateful for all the blessings that surround me. Oh! how many, many such widows this war will make, nay, has already made; scarcely a family but has lost one member. Willie has not been very well today and yesterday, Saturday he took a ride of thirty miles after some oxen, and again Monday, since then, he has been very tired. Mrs. Young has a baby boy, born today. 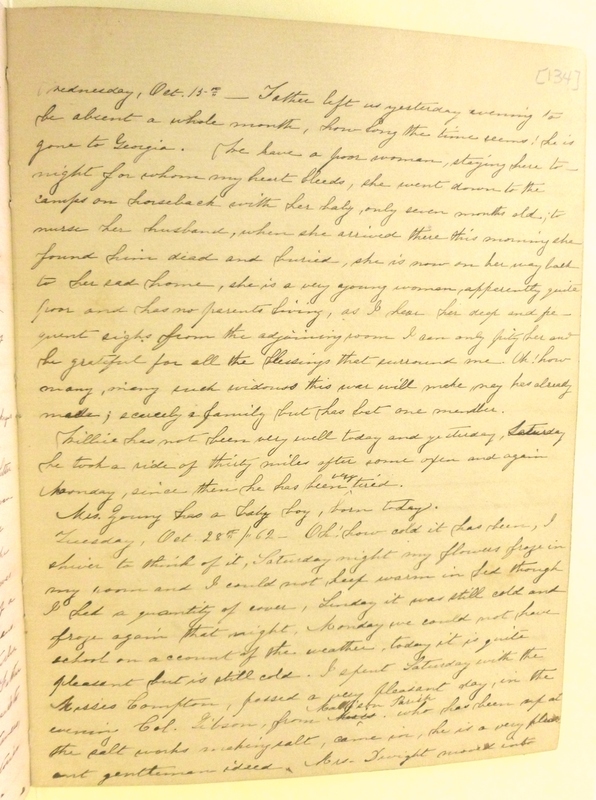 This entry was posted in Southern Historical Collection and tagged diaries, home front, Sarah Lois Wadley, widows, wives. Bookmark the permalink.